Revenue generated from the sale of the plates will benefit the World Acadian Congress 2014 and the Maine Credit Unions' Campaign for Ending Hunger. Participating in the unveiling are, from left, Emlien Nadeau, WAC 2014 president; Jason Parent, WAC 2014 Maine international president; David Rossignol, board chair of the Maine Credit Union League; John Martin, former state representative and bill sponsor; State Rep. Ken Theriault, bill co-sponsor; and Sen. Troy Jackson, bill co-sponsor. 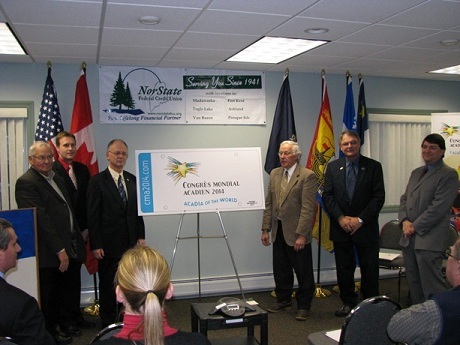 Officials from Maine’s credit unions, the state and the World Acadian Congress 2014 gathered this week at the $156 million Norstate Federal Credit Union in Madawaska to unveil the design of a new commemorative license plate to mark the upcoming gathering.